Do you suffer from pigmentation on your face? If it makes you feel uncomfortable with your appearance, you can seek treatment to fix discolouration spots. Pigmentation is what the colouring of your skin is called and it gets that colour from cells called melanin. When melanin cells become damaged or unhealthy, it can cause unusual colouring on your face. Melanin also protects your skin from UV light so when melanin cells are damaged, your skin can develop sensitivity to sunlight, which may require special attention to make sure that the condition doesn’t worsen. Some types of pigmentation include freckles, age spots, pigmentation due to acne, and more. Freckles, a common type of pigmentation among many people, appear as very small circular areas of darker colour on a person’s skin. They normally develop on areas frequently exposed to the sun and do not have any raised texture to them. Freckles are not dangerous and do not need to be removed, although some people dislike the way freckles affect their appearance as they can sometimes make people appear older than their age. Exposure to sunlight can make freckles darken and increase in number. Take precautions to put on sunscreen and stay out of direct sunlight for extended amounts of time. Age spots generally appear as one advances in age, although they can also show up on younger people as well. They can range in colour from light tan to dark brown, appear as circles or ovals, and are generally a bit bigger than freckles, although some are much larger. Frequent exposure to sunlight on the face and arms can cause the body to produce more melanin, which causes age spots. Therefore, people who spend prolonged periods of the time in the sun or tanning salons in order to achieve a darker skin tone are much more susceptible to developing age spots. 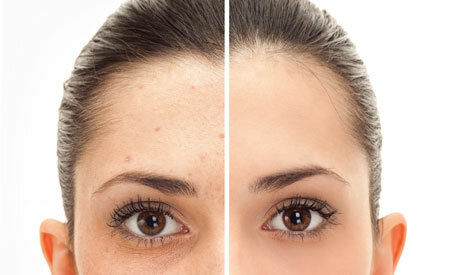 Acne scars can often appear as dark, pigmented spots on one’s face for a variety of reasons. Popping pimples improperly can irritate and damage the skin, possibly causing broken blood vessels. Sometimes the skin produces more melanin in response to this irritation. Using the wrong skin care products can also irritate the skin and make acne scars more visible. Without treatment, acne scars could take years to fade and potentially never completely go away. This is why it’s extremely important to seek professional help when treating acne and acne-related pigmentation. If you would like to get rid of these marks on your complexion, get a consultation for treatments for pigmentation on face in Singapore today. If you have dark spots on your skin, including freckles, age spots, or dark acne scars, but want to get rid of them, seek out a qualified medical professional today to help you start the process of improving the look of your skin. Don’t let dark spots on your face cause you insecurity; you should feel comfortable in your skin and love the way you look. Start your beautification process today!